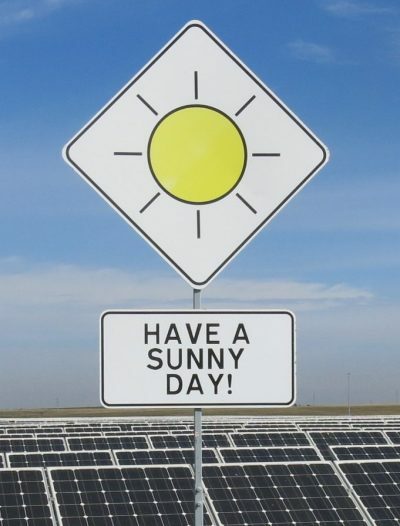 Aside from press releases we receive via email (we get a lot! ), I scan over 100 sources in order to find “the biggest” or “most interesting” stories I can for our team to cover. One of those sources is the Tesla Motors Club forum. Just after Christmas, I noticed a post that included two new Elon Musk tweets. I saved it for later, but when I went back to it, Twitter said the tweets didn’t exist. In other words, they were deleted. “Odd,” I thought. “Wonder what they said.” Soon after, I found another post on the forum referencing them and discussing why they had gone missing. The discussion brought other matters too — most importantly, range of the P85D. A lot of the comments were negative/critical in nature, painting the picture of a brewing storm. 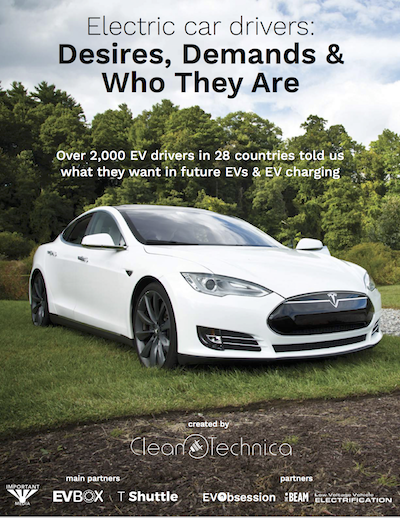 You can find the screenshots of the deleted tweets at the bottom of this article, as well as a link to the forum thread, but first, I’ve got info from Tesla and thoughts of my own that I think are important lead-ins. I reached out to my main contact at Tesla Motors (the car and battery company, not the club and forum), asking about the tweets and the range issue that was being discussed. 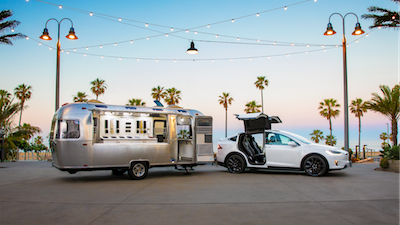 I wasn’t actually planning to write a story, since I figured that the tweets were just a bit premature and the matters they referenced as well as the range issues would be dealt with in an upcoming Tesla blog post or press release. However, I wanted to be ready to cover the story the best that I could in the case that others picked up on it and gave a warped view of things. Luckily, I haven’t seen any such stories, but with the information provided to me and a Tesla blog post published today by Tesla CTO JB Straubel, I’ve decided this is worth covering anyway. The first tweet was from December 23, and it dealt with a range topic that has apparently been a bit controversial. Basically, owners of the new Tesla Model S P85D who previously owned or still own a Tesla P85+ have noticed that the P85D doesn’t have nearly as much range as the P85+. 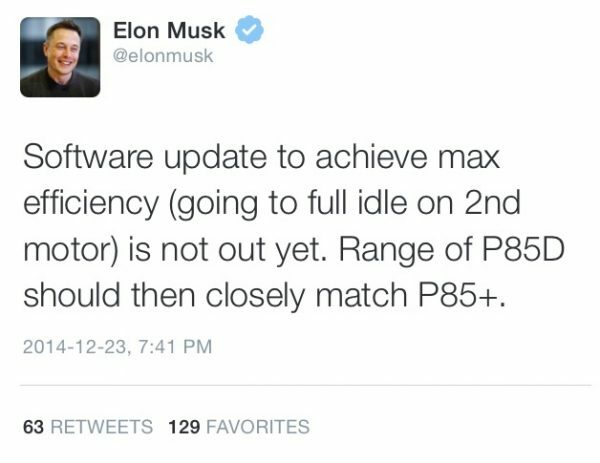 Elon’s tweet said that a software update would soon bring the range of the P85D into very close alignment with the range of the P85+. You can find the referenced tables in the Tesla blog post. If you still aren’t finding your range matches with the EPA’s numbers for your Model S, Tesla points out that your tires are likely a cause of that. If you chose 21″ tires for better handling and acceleration, your range is going to drop ~3%. Furthermore, new tires drop the range by ~5% in the first ~1,000 miles: “This can surprise (negatively) new owners or customers who have just changed their tires but will quickly improve back to a normal baseline,” CTO JB Straubel notes. Again, there’s plenty more there to read if you are interested in this topic, as well as a couple of interesting graphs. Also, Tesla has created a sophisticated range tool that you can use to play with different variables and see how they affect range. As for Elon’s other deleted tweet, that tweet was made on Christmas as an addendum to the tweet announcing the Tesla Roadster’s much-improved range. My guess, in this instance, is that Elon was stating the obvious (i.e. 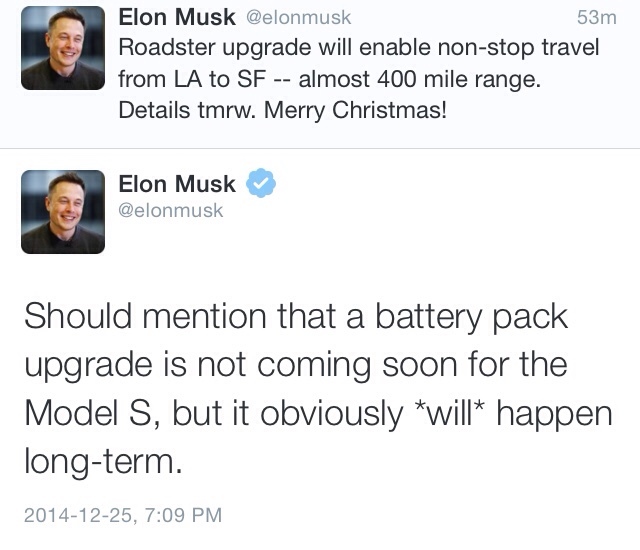 one day, Tesla will upgrade the Model S battery pack, but who knows when that will actually be? ), but then realized that was going to lead to countless questions and absurd speculation, so he just deleted the tweet to avoid all that. We all know that “D” follows “ABC,” but if Elon says it, then people think he’s talking about a big new announcement that’s around the corner… when he’s simply reciting the alphabet. All in all, the “controversy” in both of these cases seems to be another case of misunderstandings or speculation gone awry. It seems to happen more and more these days with Tesla. I guess that’s the price you pay for being such a hot company, one that people are both positively and negatively obsessed with. If you still want to dive into the Tesla Motors Club forum thread about the deleted tweets and range issues now, feel free. There’s plenty there that’s also interesting and possibly worth your time to read. Thanks to member Muskol for the screenshots of Elon’s deleted tweets.